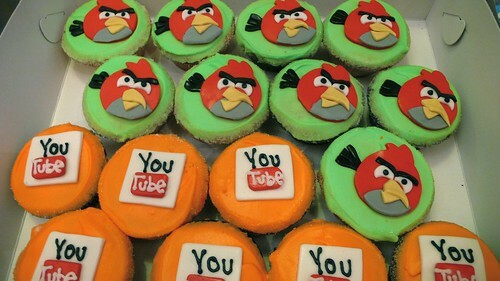 Angry Birds Cupcakes, a photo by CAKE Amsterdam - Cakes by ZOBOT on Flickr. You Tube, Twitter, Facebook, Apple, Android Google Plus and Angry Birds.... 100 cupcakes with hand made decorations! CLICK HERE to see the full "Geek-Web-Social Networking Cupcakes set!